Year after year, and once again, in 2017, initiator David Ronai provides you with a selection of exciting WebGL experiments by different 3D artists. As usual, the bandwidth is broad and wide. The only overlap between the works is the focus on the Christmas theme. At least, this explains the ineffable singing moose with sunglasses. Aside from pure aesthetics, you’ll also find interactive experiments, such as the 3D game Yolo Hero, which requires full-body effort, and access to the camera and microphone. In another game, you control an onion incapable of swimming on its way to the swimming pool. You can even plug in a gamepad to steer the onion around. The goal of the developer, Nathan Gordon, was to support the widest possible range of input methods. 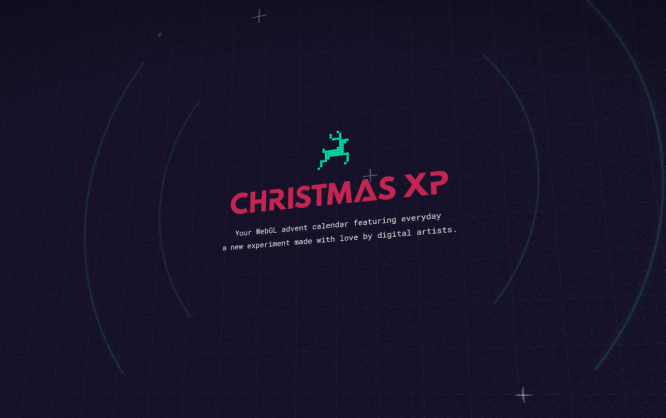 You can expect at least 24 different WebGL applications, which makes up a full advent calendar format. However, it seems as if David had some trouble deciding what to put in, which is why you can open multiple doors on some days. The experiments also work on mobile devices, with some of them perfectly adapting to gesture controls. Make a returning entry in your calendar, and let it remind you of the Christmas Experiments each morning. Maybe, they’ll inspire you to create your own 3D project.